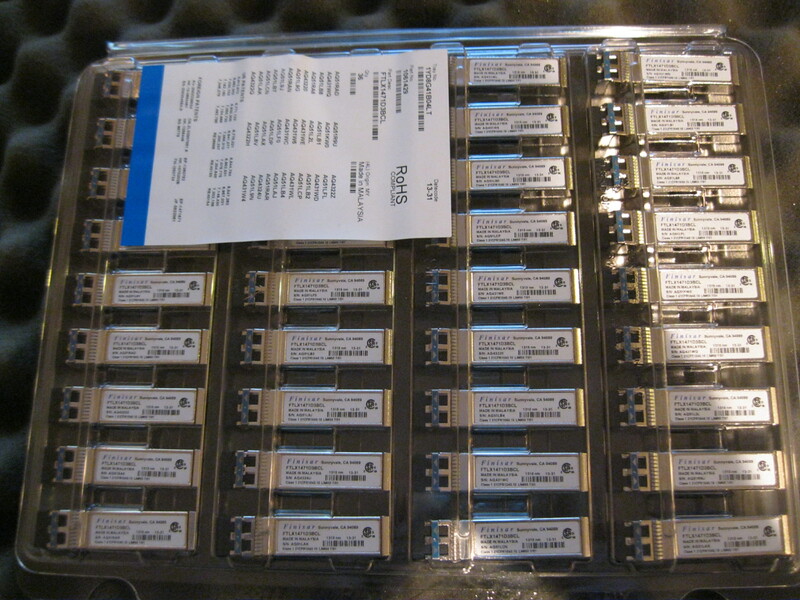 250 – NEW FTLX1471D3BCL Finisar 10Gbase-LR SFP+ @ 190.00 each New Bulk Pack. *These are packaged 36 total in a New Clam Shell. So if you buy less then 36 the SFP+ will be pulled from the clam shell and packaged in a Antistatic bag. Finisar’s FTLX1471D3BCL 10Gb/s Enhanced Small Form Factor Pluggable SFP+ transceivers are designed for use in 10-Gigabit Ethernet links up to 10km over Single Mode fiber. They are compliant with SFF-8431, SFF-8432 and IEEE 802.3ae 10GBASE-LR/LW and 10G Fibre Channel 1200-SM-LL-L. Digital diagnostics functions are available via a 2-wire serial interface, as specified in SFF-8472. The FTLX1471D3BCL is a “limiting module”, i.e., it employs a limiting receiver. Host board designers using an EDC PHY IC should follow the IC manufacturer’s recommended settings for interoperating the host-board EDC PHY with a limiting receiver SFP+ module. The transceiver is RoHS compliant and lead free per Directive 2002/95/EC, and Finisar Application Note AN-2038. 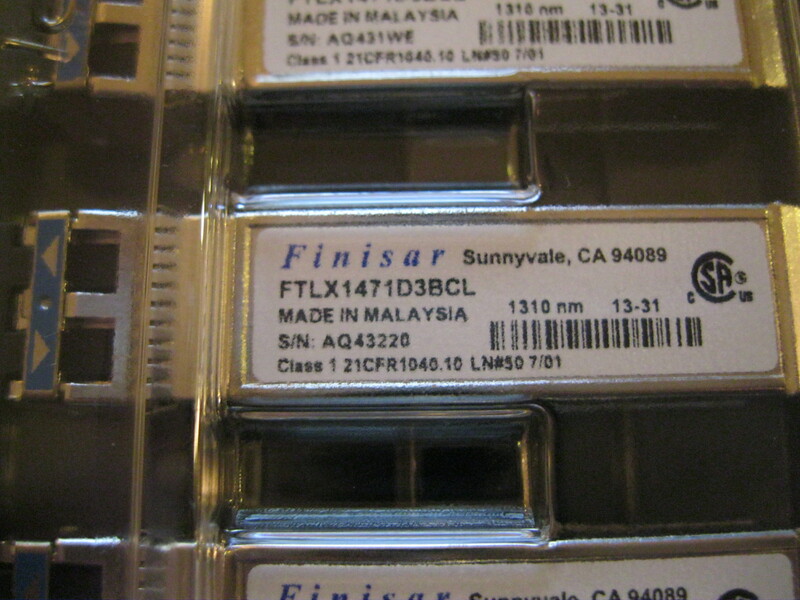 NEW FTLX1471D3BCL Finisar 10Gbase-L SFP+ for sale at Northwest Remarketing. This entry was posted in Finisar and tagged 10Gbase, 10Gbase-LR, 10Gbase-LR SFP+, 10km, Datacom, DFB Laser, diagnostic funtions, Duplex LC Connector, Finisar, footprint, FTLX1471D3BCL, hot-pluggable, interface, lead-free, mode, new, northwest remarketing, nwrusa.com, power dissipation, RoHS-6, SFP, Single, transceiver on June 10, 2014 by nwrusa. 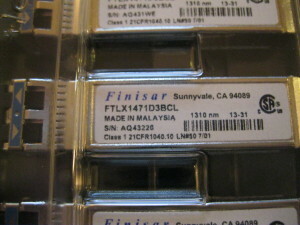 NEW FTLX1471D3BCL Finisar in stock! 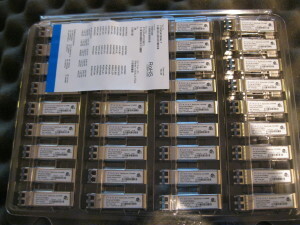 250 – NEW FTLX1471D3BCL Finisar 10Gbase-LR SFP+ for US $190.00 each. New Bulk Pack. These are packaged 36 total in a New Clam Shell. So if you buy less then 36 the SFP+ will be pulled from the clam shell and packaged in a Antistatic bag. If you have any questions, please call (503) 391-8191 ext. 118 M-F 9:00-5:00 PST or email Robin@nwrusa.com. NEW FTLX1471D3BCL Finisar 10Gbase-LR SFP+ for sale at Northwest Remarketing. This entry was posted in Finisar and tagged 10Gbase, bulk, clam shell, Finisar, FTLX1471D3BCL, new, northwest remarketing, nwrusa.com, SFP on May 14, 2014 by nwrusa.